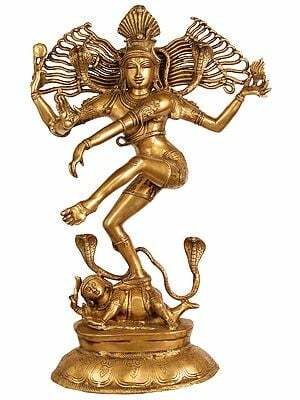 This powerful image, a statue cast in brass represents Lord Shiva in a form of dance. The statue is known for their great plasticity, perfect modeling, sharp features, well defined iconography, precision and minute details, which this brass masterpiece equally shares with the earlier examples. The artist has installed the image on a relatively high pedestal so that it does not sink into its base, lose its verticality and fails to reach the viewer’s eye-level. The figure has exceptionally fine ornamentation, thoughtful face, an extremely balanced figure with a well-proportioned body endowed with a diction – body-language of its own. In Indian mythological tradition dance has been associated with three divinities, Vishnu, Kali and Shiva. Besides as Krishna, his incarnation, Vishnu resorted to dance just once when in his transform as Vamana he danced to span the cosmos – all three worlds, in one stride. 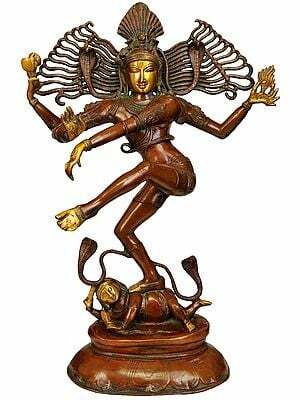 Kali’s dance, which she performed invariably at and around cremation ground, confined to annihilation. 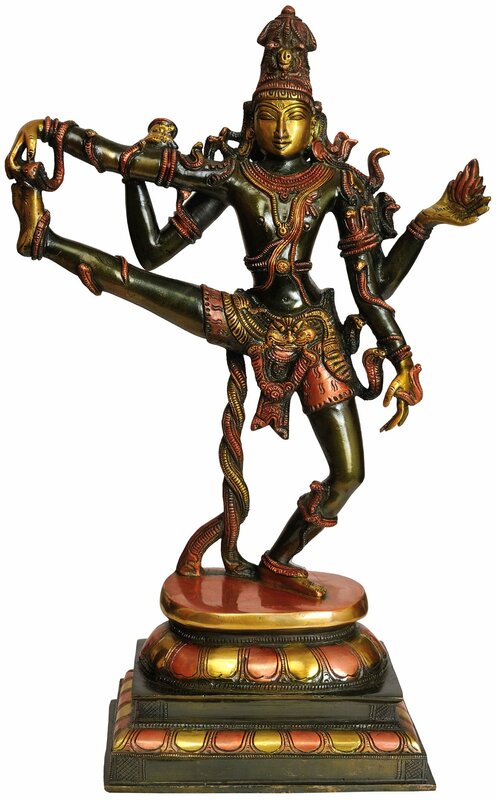 Thus, Kali and Vishnu, both as Vamana and Krishna, danced to a form and for accomplishing a single objective. 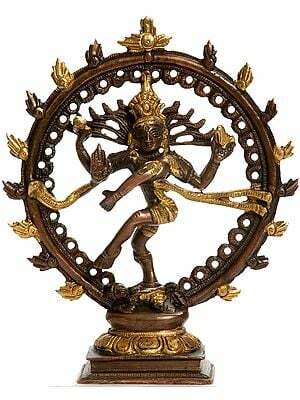 Shiva danced beyond form. His dance had cosmic magnanimity and timelessness. The dance, which the tradition has perceived as the divine science of body that makes it capable of manifesting the self within, is only Lord Shiva’s attribute. In Lord Shiva’s context the dance is the celestial exposition of the being’s total, not merely an aspect, comprising eternal six 'bhavas' – emotions, namely, 'shrashti' – creation, 'samhara' – destruction, 'vidya' – the known, 'avidya' – not known, 'gati' – motion, and 'agati' – inertness. He danced to delight and create, as also to destroy and annihilate. ‘Lasya’, the dance revealing love and aesthetic beauty, as well as ‘Tandava’ or ‘Ananda-Tandava’ and ‘Tripurantaka’, the dance-forms revealing dissolution, both are Shiva’s aspects. 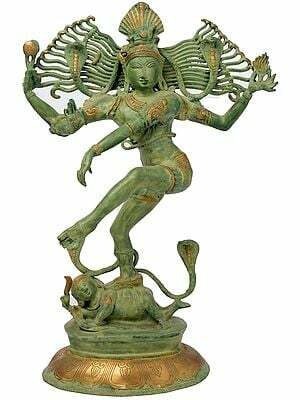 Hence, the mythological tradition has attributed to Shiva alone the epithet Natesh, meaning the supreme dancer or the king of dancers. 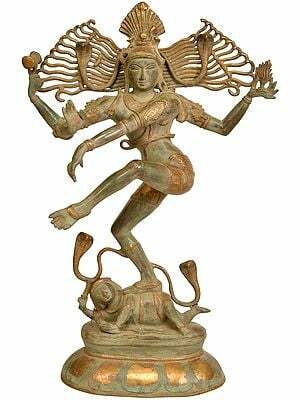 ‘Nataraja’, an epithet identical to Natesh, has in the course of time rigidified as denoting ‘Ananda-Tandava’, a dance-mode, not the dance in aggregate. 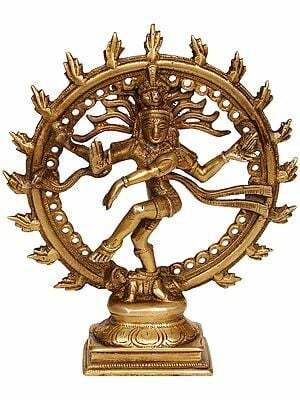 Contrarily, Natesh does not denote a dance mode or form but rather absolute accomplishment in dance – a synthesis of multi-forms, which is Lord Shiva’s exclusive attribute and which this brilliant statue manifests. This magnificent brass-cast synthesises three cosmic dance-forms, the Tripurantaka and the Ananda Tandava, the former which Lord Shiva performed for eliminating Tripura – demons’ three cities, and the latter, that he performed for destroying the entire creation after the Great Age, and Vishnukrant, Vishnu’s dance which he performed for annihilating the mighty demon Mahabali. In Vishnukrant, Vishnu had so extended his right leg that it had spanned the entire creation and beyond. In Tripurantaka Lord Shiva had lifted his left leg and holding it in one of his hands had used it as an instrument of destruction. The Ananda Tandava that he performed was fiery and accompanied by devastating sound. Accordingly, in iconographic form of this dance flames of fire are represented as rising from the palm of one of his hands, and in the other, he holds a drum. 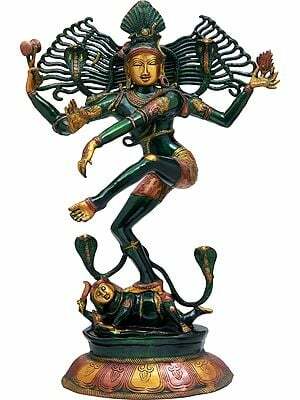 The statue’s right leg shot missile-like into space pursues Vishnukrant dance-form but different from it and quite like Tripurantaka this leg has been held in one of the hands. The lotuses used in designing pedestal are an attribute of Vishnu, but snakes scattered all over are Shiva’s associates, and with their hoods held high express the ecstasy which defines Shiva’s dance. 20.5 X 17.0" X 4.5"
19.5" X 15.5" X 4.5"
13.5" X 11.5" X 5.0"